Taking a break from 12-hour treks to the West Country for extreme pheasants, Alex Brant enjoys mixed sport closer to home on Edradynate Estate. G eorge Goldsmith offers week-long lettings of Scottish estates and fisheries. In that capacity, which he does exceptionally well, I have grown to know him over the last few years as he has done the best job of any agent in Scotland at letting Tressady, with its superb red stag stalking, excellent woodcock shooting and fine salmon fishing – if, and only if, there is a spate. While I still had plans to shoot the West Country and elsewhere in Britain this past season, I decided that I would shoot as much as possible in Scotland, both because 12-hour drives were becoming a bore and we were thinking of selling our estate which meant that I would probably be spending less time in Scotland in the future. Indeed, George had also organised shooting for me at Dell on Loch Ness which I was very much looking forward to, but the arrival of hurricane Sandy on the day we were flying back to Britain quickly put an end to that. Somehow, good man that he is, George got me invited on one of the owner’s days at Edradynate. Edradynate is a beautiful 18th century Scottish country house set high up above the River Tay overlooking Strathtay – one of Perthshire’s most lovely glens. Boasting 4,000 acres, the estate offers 200-350-bird days, high pheasants as well as contour-hugging partridges. 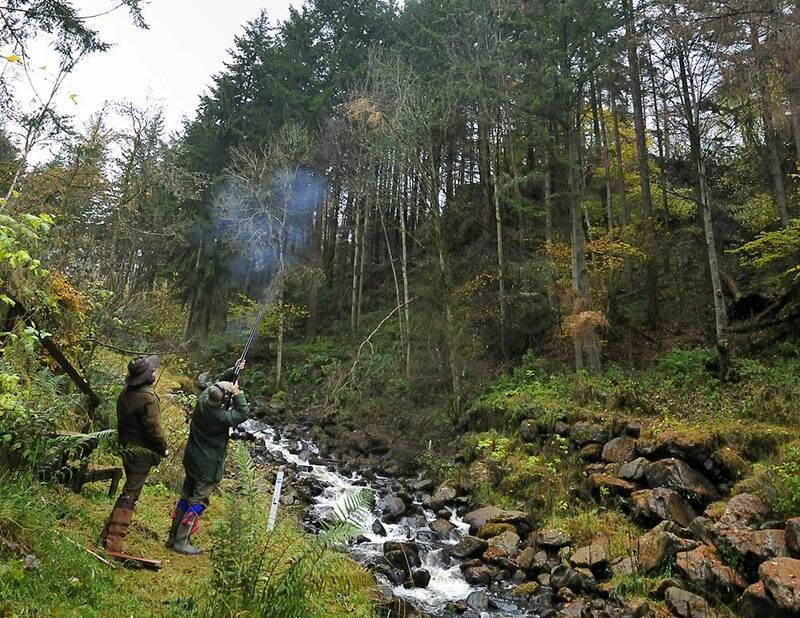 The 20 drives on the 2,000 acres they shoot are varied, from ravines and stands on the River Tay to hillside drives which afford magnificent views of the surrounding countryside. So in November I joined Michael Campbell, the Laird, his charming wife Linda and their friends to shoot the second day of a weekend’s shoot. I received an email from George saying that the dress was smoking jackets, no need for ties. This suited me perfectly as that is the way I prefer to dress on the shoot evenings. Lorne MacNicol, my keeper from Tressady, and I made the relatively easy drive down the A9 turning off near Aberfeldy. I was greeted by Linda on my arrival, followed quickly by Michael. I arrived in time to head to my room, change, and meet the other guests in the drawing room before dinner. On my return downstairs there was only one other couple in the drawing room – a husband and wife engaged in a serious looking game of backgammon. I was slightly concerned as he was in black tie, formally attired. Had I somehow misread George’s missive? I have to say I was greatly relieved when Michael appeared dressed in a similar fashion to myself – smoking jacket, tartan slacks and velvet slippers, sans tie. As I was unknown to everyone, I was amazed at just how easily I fit in. Winston Churchill famously said that a polo handicap was the best social passport in the world… being a known shooter is not far off. Shooting as common ground always makes conversation flow easily and once the common ground is established, more varied and interesting conversations into politics, society and good jokes are quickly broached. Johnny Moss, seated on my left at dinner, a former Army man, and once Extra Equerry to HRH Prince Philip, quickly figured out – based on the shoots that I attend – that I was primarily a tall bird specialist. Michael pointed out, and there is certainly truth in it, that in many situations less tall birds provide very interesting shooting as they fly in many directions and more angles go into the equation. I did not disagree. After dinner, Linda gathered the ladies to the drawing-room – very old-fashioned, very civilised – as the men clustered at Michael’s end of the table to smoke cigars and drink port. We then repaired to the billiard room to play some after dinner games of which I was completely unaware, and at which I sucked. Michael knew that I had just arrived from the States the day before and suggested, most considerately, that perhaps I should get some shut-eye – my American translation of his remark. Grateful for this, I was in the arms of Morpheus quite rapidly which is most unlike me. Also, I awoke quite early, way before my alarm went off. As is my wont, I had laid out all my clothes and kit for the day ahead as I unpacked the previous evening. I hate shaving before having java as I always feel I am likely to slit my own throat as I still use an old-fashioned blade, but on most shoot days I do risk life and limb, or at least life and the carotid artery. Breakfast was hale and hearty and taken in the kitchen room rather than the formal dining room of the previous night. Red squirrels are common and scampered outside the windows. Soon we were gathering guns from the gunroom, boots from the hallway, and heading out to shoot. I drove with Michael, while our most excellent photographer Glyn Satterley rode with Lorne in the front of the Tressady pick-up and Bubba sat patiently but with great anticipation in the back as it was his first day of the season. We headed out to our first drive, The Triangle, which was primarily partridges. I was back-gunning but did get some shooting at the few birds that the front line missed. These flew as classic partridges rather than tall, and the more interesting shots were crossers, not poached as there was no-one to my right. A tremendous number of the birds broke cover and headed left rather than coming for the line. What I did not realise, was that they were actually flying into a different drive which we were doing last. The Orchard was the second drive and it provided some very good pheasants indeed, especially for the Guns on the left side of the line. I was second from the right, with the absolute right-hand Gun at least 100 yards away up in a corner near the road. The three Guns on the right had a reasonable amount of shooting and I took one cracking bird over my left shoulder. All were experienced Shots, a couple particularly strong, including Johnny, and many birds were bagged. Edradynate Den is one of their signature drives. It is down a lovely ravine with hills and trees going up on both sides and in theory, I had drawn perfectly. But wind and the luck of the draw often interfere with the best laid plans of mice and men and shoot captains, so at peg 4 I actually had relatively few birds. The good birds that were heading my way were generally shot by one of the three Guns upstream and many of the birds that normally should have crossed over me broke further down the line, giving the lower numbers the best shooting of all. There were some truly lovely birds on this drive, and many of the tallest and certainly the fastest of the day. Elevenses were served on the banks of the River Tay. It was a lovely pool over which we stood and consumed comestibles. On the way to elevenses, Michael pointed out to me one of his signature drives called Himalaya, which takes place with the Guns lined along the banks of the river and three back Guns taken by boat to the other side. Looking at it I knew this one would be spectacular. Regrettably, at least from my perspective, they do not shoot this drive so early in the year. Croftnuisk was another good drive, primarily pheasants, although the birds were not as tall as on the previous two drives. Again I was back-gunning and had the great misfortune of being 100 yards directly behind Johnny, who seemed unable to miss anything under 35 yards. That said, I had some cracking birds on my left and right again taken as very long crossers – something in excess of 50 yards, plus the occasional good bird over me, as they seemed only to get through when Johnny was stuffing his gun. A delicious lunch was served back in the main house. And while we waited for the staff to put it out on the sideboard, I wandered over to the conservatory which had absolutely breathtaking views down the glen. Linda told me how they had taken down a number of trees to enhance the view. That made great sense as the scene was spectacular. Ski Jump, which is another of their signature drives, had me in the hot seat. Birds were being pushed out of the woods at the top of the hill and coming down not exceptionally high, but rather at great speed as they were working with gravity. The occasional pheasant was in the mix as well – they kept the picker-up behind me quite busy and Bubba got a few good retrieves as well. One very interesting note is that the keepering staff strategically placed screens across the fast-flowing stream to catch the birds that would otherwise be swept away. It was a narrow stream and I thought this was a very clever move. The day’s shooting done, I had truncated afternoon tea and said my goodbyes and thanks to all, packed up the pick-up, and Lorne, Bubba and myself made the short journey home with many lasting and fond memories to be savoured at leisure. There was not a shoot in place in 1983 when purchased by Michael Campbell. It is presumed that the woods must have been planted by previous owners, the Stewart-Meiklejohns, and they possibly had a bit of a low ground shoot before the war. Single or double days shooting are available for let on Edradynate. For local teams the Estate is easily and quickly accessible from the A9 through Aberfeldy. For those travelling from further afield, accommodation is available in the warm and stylish Edradynate House. The house is exceptionally comfortable with traditional furnishings, lovely antiques and carefully chosen artwork. The bedrooms benefit from being almost all en-suite and recently refurbished. The large dining room is the perfect setting for either formal or informal dining and, as with all of the reception rooms, boasts stunning panoramic views across the lawns over the Tay Valley.